Like many travelers to Belgium, I had always set my sights on Brussels and Bruges and didn’t even think of visiting Ghent. Then a few weeks ago, blessed with an unexpected extra day to spend in Belgium, I made a day trip to Ghent. I was in the city less than a half-hour when I began wondering how had I missed this spectacular city for so many years. Given the beauty of both Bruges and Ghent, comparisons of the two are unavoidable. Suffice it to say that while Bruges’s reputation has been built on the romantic ambiance of its canals and intimate streets, Ghent showcases its beauty through its wealth of imposing architecture and broad open spaces. In fact, there are more listed historic buildings in Ghent than in any other Belgian city, and all less than an hour from Brussels by train. 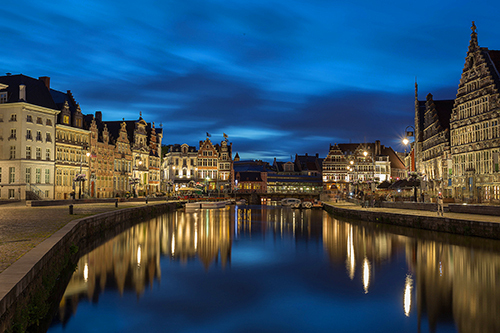 In medieval times Ghent was one of the largest cities in Europe, second only to Paris. Today it is a city of culture, a place with an abundance of museums, galleries and assorted architectural gems. In addition to its cultural offerings, Ghent’s major attraction is its well-preserved medieval city center, one of the finest in Europe. Many of its most beautiful medieval buildings are in the historic areas around the old Graslei harbor, a car-free area that is the largest in Belgium. It’s the perfect place to wander about and later relax in one of the area’s many restaurants and cafés. After arriving my first task was to seek out the city tourist office. I found it the Old Fishmarket off a little café-lined square right next to the Castle of the Counts. The woman there was quite helpful, providing me with some good information including a map outlining a two-hour walk around the old section of the city. I was quickly off, stopping immediately at the imposing Castle right across the street. Nowhere else in the world will you find such a massive castle right in the middle of a city, not on a hill above it. You would think that it would be out of place but it actually fits in its urban setting quite nicely. Entrance to the castle is €10 per adult. I continued on, turning here and there, wandering down side streets that looked interesting. It was an easy, quiet, relaxing walk, colorful and historic at the same time. Walking down Jan Breydelstraat I soon came to Appelbrugparkje, an old picturesque park shoehorned in between the old buildings. It was right across the street from the Design Museum, a modern museum with an 18th-century facade. Its popular collection includes furnishings ranging from modern, Art Deco and Art Nouveau all the way back to the Renaissance. Not far beyond is the old St. Michael’s Church (its 500-foot tower incomplete for centuries due to a lack of funds) and, along the river, an old Dominican friary that’s now part of Ghent University. Adjacent to it is St. Michael’s Bridge, the best place to get a superb view of the skyline of the old city as evidenced by the numerous travelers on it taking panorama shots of the area with their phones and iPads. Cross St. Michaels and you’ll be near St. Bavo, Ghent’s most famous cathedral. It is nothing short of magnificent, as is its renown work of art, the Adoration of the Mystic Lamb by Jan and Hubert van Eyck, the most important work in Flemish art. Pay 4 Euros upon entry and you can view it in the rear of the cathedral (to your left as you enter). Unfortunately no photographs are allowed inside the church. Although St. Bavo was once a small parish church, nothing remains of the original. There are, however, several art treasures scattered about including a work by Rubens and a rococo pulpit dating from 1745. Sint-Baafsplein(St. Bavo Square) in front of the cathedral is the historic center of the city, Ghent’s equivalent of London’s Trafalgar Square. Nearby is the city’s Unesco-listed 14th-century belfry, topped by a dragon weathervane. Wandering on through the historic quarter I passed the Sikkel, the home of an extremely wealthy 15th century Ghent family. (The family was exceptionally wealthy. since it had its own well at a time when the city’s 65,000 inhabitants had to share only five wells). What is interesting about the Sikkel has nothing to do with family history, however. Today you can walk down _____ and at times hear music drifting from the windows, giving an ethereal ambiance to the neighborhood. The music is coming from students at a music academy which now occupies the building. Continue on pass the Sikkel and you’ll soon come to Ghent’s Town Hall, a schizophrenic building architecturally speaking, 16th-century Gothic on the right side, Italian Renaissance on the left. After wandering the historic center for an hour or two you’ll find the best views of medieval Ghent to be had from a café table on either the Graslei and Korenlei sides of the river-harbor. The beautiful architecture on both sides of the harbor tell the story of Ghent’s amazing rise to economic power during the Middle Ages. Many travel guides – and travelers – laud it as one of the most beautiful city views in Europe. I agree. Go see for yourself. Jim, I feel as if I am “there” …. I’ve never thought of visiting Ghent, either, except maybe as a river cruise excursion but you have altered that perception. Now, I want to visit Ghent as a dedicated destination! Thanks for an inspiring article …. Donna …. You should go — it’s a great city, especially good as a day trip if you’re pushed for time. A wonderful article, exploring an enchanting city. Like you, we went to Ghent as a last minute trip from Brussels, and fell in love. The Design Museum had a wonderful glass exhibit when we were there. I left my husband eating pea soup and drinking beer while I braved the boat ride through the City ( a mite chilly that day). I’m glad you liked it. Having pea soup and a beer on a cold day in Belgium sounds great to me! I spent a week in Belgium last year, and had a wonderful time. Ghent was included on one of the tours I took and I wish we had spent more time there. I think many people consider Belgium/Brussels as just a stopover place and don’t consider exploring the entire country; they are missing out on a scenic and historic experience. Ghent is absolutely beautiful. I really love it there. It’s also a fantastic place for creative folks, as there are many DIY shops etc around. HI going to Belgium in Sep tyour article is very helpful as Ghent was on my list to visit…. History is something I love and Ghent seemed to be filled with hopefully my kids will enjoy it…. any resturants tips would be appreciated.